In the Gary Post Tribune, John Wolf, a WWII vet and minister who served in Saipan wonders if the the bloody beaches were worth it. My ship was a part of a large amphibious task force. We carried the 2nd Marine Division and landed them on June 15. As was our task in previous island invasions, we took on casualties from the beach — nearly 200 in a short time. Some I recognized as the same Marines I had served the sacraments to the night before. I almost joined the Navy ROTC in college. I thought it would be a good way to have some adventures and see the world. I’m not sure why I didn’t. I think it had something to do with Jimmy Buffett and this dude that you’ve probably never heard of who had a show on the Travel Channel. At some point I decided that I could make my own adventures and probably not get shot at. I graduated in the spring of 2001 and, if I had enlisted in the ROTC, I would have began my two years of mandatory service immediately. I’ve never been to a desert, but no doubt I would have been shipped to the Mid-East almost immediately. 1) Swaddle = Enhanced Sleep Aid. Sure, at a certain point it is probably illegal, but what’s so illegal about mom, dad, and baby getting a full night of sleep? Does anyone know when the illegal point is? Harper is busting out of her — velcro enhanced — swaddle already and starting to not sleep all night. I always thought my parents were making that crap up. Last night I plopped down in my recliner while holding Harper. Her head bumped into my collar bone and she started screaming. It hurt me bad. Everything I write I read aloud. I would hate to think how many hours or times I read WAIW? aloud to myself and sometimes to Annie. I read aloud as a I write. I real aloud at day’s end to review what I’ve written. I read aloud entire sections and chapters. Once the book was done, I read it aloud several times through. Each time I would make changes. In fact, I’m still making changes. My copy of WAIW? has sentences scratched out and words added. A few days ago I asked if anyone had any good ideas for a giveaway for the relaunch of the blog (which is going to be awesome by the way). Larry Olson at Wiley, my publisher, suggested he would pitch in an iPod video Nano. How cool is that? I’m a bit jealous. I’m not sure how the giveaway will be decided, but I doubt you’d all let me get by with being the winner. Darn. Welcome to the world Cale Taylor (my nephew)! 1)	Blog categories – As you can tell from the category list on the right, this blog is a mess. Half of those categories I created and never posted to again. So, the good folk at Rule29 who are designing the pending spiffiness are laying down the law. I only get five categories. Any thought on what they should be? 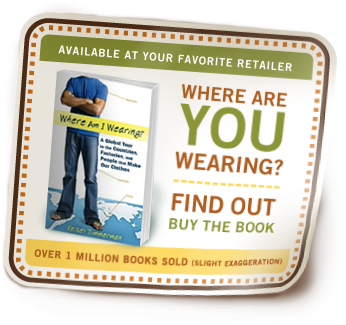 I’ll toss out a few: Travel, Engaged Consumer, This Writer’s Life….? a. A rare Advanced Reader’s Copy of WAIW? 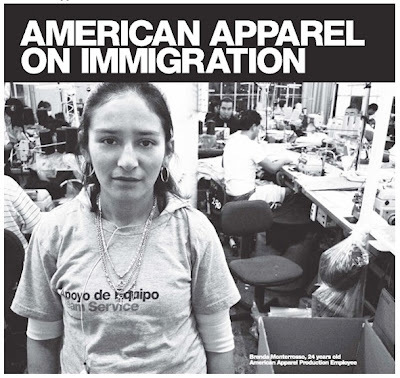 American Apparel, the nation’s largest remaining clothing manufacturer, infamous for ads like this and this and this used Woody Allen’s photo on one of their billboards without his consent. Allen is suing for $10 million. American Apparel gave him the “Oh no you didn’t” finger wag and their lawyer Stuart Slotnick (what a great name for a lawyer, if I injured my back or was involved in a motorcycle accident, I’d call him!) countered with document requests and subpoenas digging into Allen’s personal life.